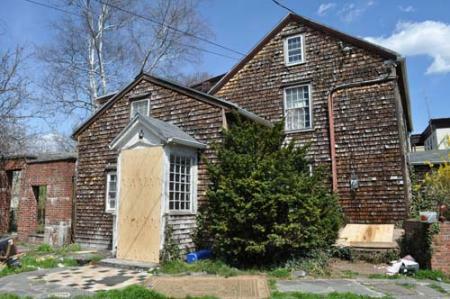 A historic farmhouse on Norfolk Street, one of the last vestiges of the neighborhood’s now-distant agricultural past, was condemned by city officials on Tuesday after inspectors found the vacant buildings unfit for human habitation. The Fowler/Clark Farm, which is listed as a historic landmark, was boarded up by emergency crews as firefighters and other city workers combed the property for evidence of trouble—which was found in abundance. Darryl Smith, a commissioner with the city’s Inspectional Services Department, said that Tuesday’s action came after complaints from neighbors to the mayor’s Neighborhood Response Team in Dorchester-Mattapan, which Smith coordinates. Smith said a HazMat team from the Boston Fire Department was called in after an oil tank was found cut in half in the basement— with a lighter inside the bisected tank. “I think it was a good thing we came when we did,” added Smith, who noted that the site has been a point of concern for preservationists for the last several years. The property is now controlled by a trust after a family dispute among the previous owners could not be resolved. The most recent occupant of the house was evicted on March 1, said Smith. “An attorney for the owner was on site on Tuesday and we have assurances from him that they will have a plan of action in place to clean it up and secure it.” Smith said the owners will be called into Inspectional Services for a formal hearing on the property’s conditions next week. According to the Dorchester Atheneum website, the main, wood-frame house on the Fowler Clark Farm dates back to between 1786 and 1806. Once situated on more than 11 acres, the property was sub-divided at the turn of the last century and now sits on about a half-acre of land. It is one of six properties in Dorchester and Mattapan that have been designated as city landmarks by the Boston Landmarks Commission.